McLean’s Upper School students are busy preparing for college—learning to appreciate fine literature, engaging in the study of cultures throughout history, solving complex problems in AP calculus and science, and expressing their ideas in compositions. Some are benefiting from the study of computer science, technology, and robotics. They proudly celebrate their jazz combo ensembles, quality dramatic and musical performances, computer graphic designs, and art displays. This is a high school that applauds students with a strong work ethic—young people who are ready to get involved. Upper School students have written and implemented a student government constitution, created and supported an honor pledge, and designed and followed through with a volunteer service program. Students have organized social activities after school and on weekends, including spirit weeks, a fall dance, a senior farewell, and junior/senior prom. In addition, they have taken an active part in athletics, developing competitive teams in a variety of sports, including basketball, cross country, track and field, wrestling, soccer, volleyball, lacrosse, and softball. Our 2013 Boys Varsity Basketball team was both regular season and Potomac Valley Athletic Conference (PVAC) tournament champions. Our 2017 and 2018 Girls Varsity Basketball teams were back to back regular season and PVAC tournament champions, having an undefeated season in 2018. McLean faculty members have extensive knowledge of best practices in working with diverse learners. Along with the Coordinator of Learning Services, teachers create a Student Learning Profile℠ for each student and an Academic Achievement Plan for students when necessary. Students also receive additional support from faculty in one-on-one or small-group tutorials. 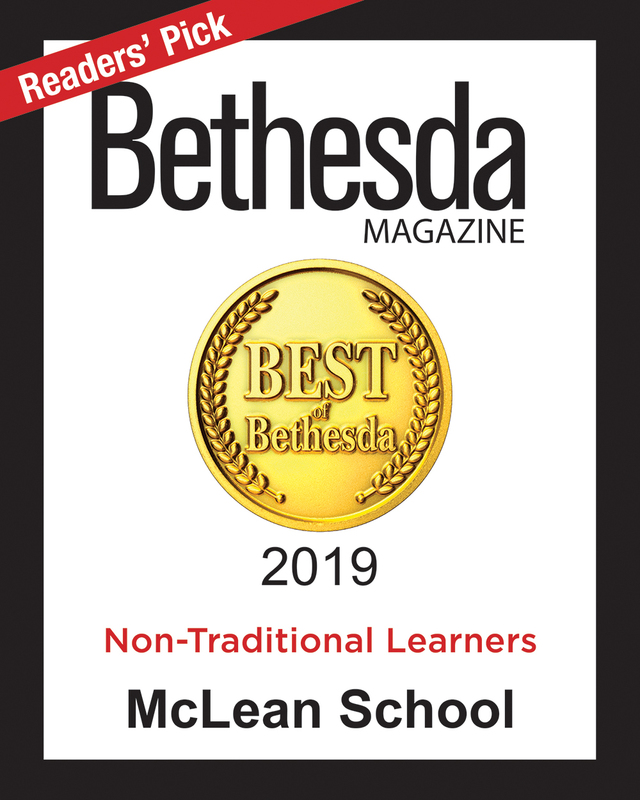 All students benefit from the flexible educational styles used by McLean teachers. Students may choose preferential seating, extended time on tests, laptop computers, iPads, note-taking buddies, and speech-to-text software. When appropriate, students may also receive readers for exams. Self-advocacy is a hallmark of McLean, and our Upper School counselor works as part of a multidisciplinary team to create a safe and respectful environment where all students may learn. Students become confident that they can handle tasks they encounter by working closely with their teachers and using the strengths of their particular learning styles. Qualified seniors may enroll in courses at local universities, in particular, American University, if schedules and course obligations permit. At the end of the senior year, students develop a Senior Project. Designed over six months, the project offers the opportunity to spend the last two weeks of May in a volunteer program or as an intern in the “real world.” The project concludes with a formal presentation before the Upper School community. Our superb college counseling program helps students identify and select the colleges that best match their academic strengths, learning styles, and personal interests. The college counselors meet regularly with juniors and seniors to review the college application process—researching colleges, planning visits, writing essays, and practicing interview skills. In addition, the college counselors work with individual students and their parents, helping them navigate and manage the college admission and financial aid process. Students learn to use Naviance to manage their college applications. We are proud of the results of a McLean education. In the last 5 years, our graduates have been accepted at over 220 colleges and universities, including Duke, Brandeis, Johns Hopkins, Tulane, Vanderbilt, and Vassar— and on average are offered in excess of $1.3 million in merit scholarships each year.